The Fed noted in a statement that growth has slowed, business investment has softened and exports have declined. The Federal Reserve downgraded its assessment of the U.S. economy Wednesday after a winter in which growth nearly stopped. It offered no sign that a rate increase might be coming soon. On a day when the government said the economy barely grew in the January-March quarter, the Fed appeared no closer to raising its benchmark rate from a record low. The Fed noted in a statement that growth has slowed, business investment has softened and exports have declined. It also repeated previous language that it needs to be "reasonably confident" that low inflation will move back to its 2 percent target. The only parts of its policy statement that the Fed changed Wednesday dealt with its assessment of economic conditions. The new statement said growth has "slowed during the winter months, in part reflecting transitory factors." That was a downgrade from its March statement, which said growth had "moderated somewhat." Earlier Wednesday, the government estimated that the economy grew at a barely discernible annual rate of 0.2 percent in the January-March quarter, battered by harsh weather, plunging exports and scaled-back energy drilling. It was the poorest economic showing in a year and was down sharply from a 2.2 percent annual growth rate in the fourth quarter. The job market has also slowed of late. U.S. employers added just 126,000 workers in March, the fewest since December 2013, breaking a 12-month streak of gains above 200,000. Gauges of manufacturing, housing and consumer spending of late have been weak to modest. The Fed's decision Wednesday, approved 10-0, means it will keep its key rate near zero, where it's been since December 2008. That's when the central bank slashed the rate as low as it could to support an economy heading into the deepest recession since the 1930s. Until the economy's recent slowdown, many economists had thought the first rate hike could occur in June. But as evidence has grown that the economy likely slowed significantly in the first quarter, analysts have been pushing back their estimates of the first Fed rate hike until September or possibly even later. 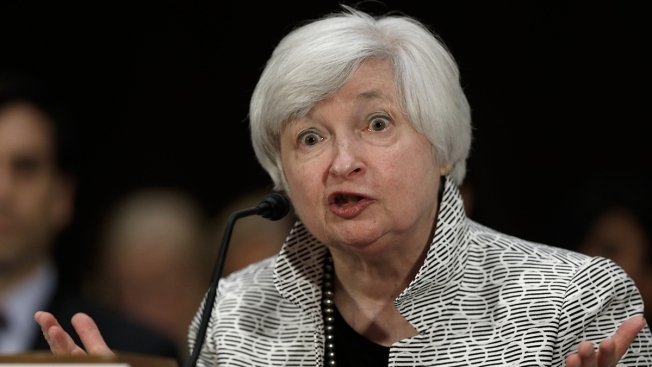 Some analysts say persistently modest growth and low inflation could keep the Fed on hold until 2016. Inflation, by the Fed's preferred measurement, has been running below 2 percent for nearly three years. It recent months, inflation has fallen even farther from the 2 percent target as tumbling energy prices and a surging dollar have reduced prices. The statement said job growth had moderated, a nod to the tepid March unemployment report. The Fed statement also said household spending had declined, though incomes were described as rising strongly, in part reflecting lower energy prices. The statement that business spending had softened and that the housing recovery remained slow. The sharp drop in oil and gasoline prices had been expected to help boost consumer spending. So far, it hasn't. The economic impact has been mainly negative — layoffs by oil-industry states and cutbacks in investments by energy companies. Perhaps the biggest drag on the economy has been a sustained rise in the dollar's value. The stronger dollar has hurt American manufacturers by making their goods costlier overseas. It's also made cheaper foreign imports more competitive in the United States, thereby squeezing sales of U.S. companies and depressing profits. Lower import prices have helped hold U.S. inflation below the Fed's long-run target of 2 percent rate. Still, economists expect the benefits of lower energy prices to boost consumer spending — and lift economic growth — the rest of the year. Economists say that many people who are now pocketing their savings from cheaper gas will likely step up their spending in the coming months. Once the Fed does start raising rates, it's expected to do so very gradually. And the timetable for a rate hike could be delayed if growth doesn't pick up or if some crisis should erupt. One such threat could be a Greek debt default that spooks financial markets.